I’ve been trying to find a way to script or automate the creation of a new Windows VPN connection that uses L2TP/IPSEC with a pre shared key and automatically uses the current user’s credentials, but it seems there is no way to do this using the CMAK, netsh, various powershell scripts, or GPO Preferences as none of them include all of the options we needed to set. So I have come up with a .NET app for doing this and am posting the code here in case it helps anyone else out. The image below highlights the settings that we were struggling to configure via any kind of script or automated process. The MS CMAK tool lets you specify a pre shared key but does not let you enable the “Automatically use current windows credentials” option (there is an extra line you can add to the config file manually that supposedly enables this but it simply does not seem to work). This powershell script does not let you specify a pre shared key, and neither does the Server 2008 GPO Preferences option that lets you create VPN connection. Also note that this will need to be run “As Administrator” so I set the application to always require full admin rights so that you get a UAC prompt to elevate whenever you run it (to avoid access denied errors). If anyone else is in need of a similar thing then let me know and I will see if I can make this available on my website and make it a bit more flexible (at the moment it is hard coded to only use L2TP with a pre shared key and use the current user’s logon credentials, you might not want that). Will have to check with the author of the DotRas library to see if this is OK as well. I want to create a file that I can email out that will automatically setup remote computers to connect to my L2TP VPN Server. I don’t need it to use current credentials. What would be the best way to do this. Thanks Chris! We have exactly the same requirement as you did. Could you possibly make the executable available as is? This is a great piece of work Chris, I think it will really help me. I’m planning to use Powershell thru Group Policy to roll this out. One small request. How can I add a line that will force it to over-write an existing VPN connection of the same name each time it runs? We’re tinkering with our VPN connections and I’d like to be able to modify a setting (e.g. pre-shared key) and have this over-write our user’s VPN connection with new settings each time they boot up. ERROR: ‘Test VPN’ already exists in the phone book. Oh and I still don’t really see the need for the Powershell script, you can just specify the compiled EXE directly from a GPO startup script and use the arguments section to specify the command line arguments. Unless of course you do other stuff in your Powershell script as well as this. Thanks for your help. I added those lines, compiled, and it works perfect when running on my local PC – overwriting the connection. However when I run it from Goup Policy, it doesn not. How would you suggest I run it from Group Policy? At the moment I have created a GPO using Computer Configuration>Windows Settings>Scripts>Startup and pointed it directly at the .exe which I have copied to the policy script folder, with the correct parameters. Which bit doesn’t work, creating a VPN connection when one doesn’t already exist or just the replacing of a connection if it already exists? Bear in mind that in a computer startup script the program will be running as the Local System account so it won’t see any VPN connections that have been created for one user only. It’s OK – figured it out. I had another script creating a conflict. It now works perfectly! Hello Chris, Andy again. Thanks again for the great little piece of code. Another small request. Is it possible to add a line that will enable split tunnelling when creating the connection? Networking tab > IPv4 Properties > Advanced > Use Default Gateway on Remote Network? Wow, thanks for the quick reply! That worked great. no worries 🙂 all I did was open the visual studio project that had the code shown in this article in, then typed “VpnEntry.Options.” and looked through the list of available properties that Intellisense shows you. Thank you so much for the great post on this! I am the systems admin for a school district working at rolling out a couple hundred laptops as student rentals and finding this post was a huge relief! This worked perfectly for us, thanks again! No problem 🙂 glad it helped! No I’ve never seen that happen. What OS are you running it on? I assume you can manually create the same VPN connection without a problem? HI thank you for the quick reply. After disabled UAC I successfully created an entry, but at the next attempt the freeze problem was back. Also, I see the connection but when I hit connect nothing happens. I looked around it’s properties and look ok to me. So is it just freezing when the connection already exists? Also you shouldn’t have to disable UAC for it to work – it does require admin permissions so if you run it as a normal user account it will probably fail with an access denied error but shouldn’t just freeze. It will run in an windows service with system account, so the rights is not an issue. I’ll keep you updated and when I’m done I’ll put a snippet here. OK, I had some time yesterday for some tests. I am now able to create, delete connections, and connect to them using rasdial not dialer dontrol. Dialer control do not work for me. After I finish the rutine, I’ll post it here. Is there a way to create this with “Challenge Handshake Authentication Protocol (CHAP)” unchecked, turned off? This is not in my wheel house, I was unable to find a registry key associated. Would this be in the library or native WMI library? Yes, found that one, thanks! We are having an issue creating a desktop shortcut. Does anyone have any pointers? With using our usually very reliable picture taker tool (prism deploy) we are able to create the desktop icon to the VPN connection but when you double click on it it says VPN cannot be found. Only by manually creating it ( the desktop shortcut (right click and drag from Network Connections) does a desktop shortcut work. Thanks! EDIT: Actually that’s odd, if I create a shortcut to 2 different VPNs the GUID the shortcut points to is exactly the same :S Looks like that GUID is just purely the GUID of the dial up connection manager. If you look at the contents of the actual shortcut file itself though (by using the TYPE command in command prompt) you can see it has the path to the user’s phone book PBK file in it, as well as the destination host name / IP address. Thanks again for your great work. Still using your fantastic code to deploy to our 100+ users. Is there a parameter I could introduce to populate the field ‘DNS suffix for this connection’ under Networking tab > IPv4 > Advanced > DNS tab ? which type of project must open in Visual studio 2010 ? i copied your script in a txt file, how do I rename it? File.VB? Which type of project must open in visual studio 2010? and i must set informatio in the argument parameter eg. Dim PresharedKey As String = My.Application.CommandLineArgs(ABC123) ? I’m currently stumped by the VpnEntry.Options.RequirePap and RequireChap lines in my code. I need to require PAP authentication and disallow CHAP, but nothing I do seems to make these options work in my code. Any ideas or suggestions are appreciated. This is so far after-the-fact, but I was having the same issue until I used dotras to inspect the Options on a manually created VPN entry to see what I was missing. The culprit is VpnEntry.Options.RequireEncryptedPassword. If this is True (which it is by default), then Chap and MSChap are enabled and Pap is disabled no matter what you specify otherwise. When you set VpnEntry.Options.RequireEncryptedPassword = False, the connection is still encrypted as long as your RequireDataEncryption = True, nothing is sent plain text over the wire. Hope that helps someone – had me scratching my head for awhile. I have been looking for this code every where, you couldn’t send me the compiled version of this code ? Could you please send me a copy of compiled program ?? I dont have known of programing but I have the same need of you. Hi, could you please send me the copy of your compiled exe? I’ve spent the last day or so working on this sample code, refactoring it for a project i’m working on. My use case is that i’m connection Windows 7 laptops to an OpenBSD L2TP/IPSEC environment using PSK and migrating it PKI in the near future. Each user gets a pre-built, custom deployment package that contaiins everything (including username/passwords) for a set of VPN connections. I refactored this code to make an app that the package install script calls for each VPN connection to be deployed (during this migration phase, there’s 4 connections, with the PSK connections to be removed in the future). Hopefully this code is helpful for folks. 2) App takes additional flags such as [PSK|PKI] and a username/password in addition to the PSK pass in the original code. 3) resulting VPN connections hide the user interface and dont prompt the user for a username/password. It’s assumed that password changes necessitate a total redeployment of the install package this is bundled with. ‘deployment of pre-configured VPN connections to users. ”and set-VpnConnection that do the heavy lifting for deploying VPN connections. ”have to be made through a comunity provided library called DotRas to achieve the same goal. ‘3) Configure the interface with a pre-determined set of user credentials to simplify user experience. ‘ will be bundled inside the package and called with the prescribed users credentials. ‘Thanks to Chris Wright (cwright@cjwdev.co.uk) for the initial source code that is modified below. ‘Further thanks to Jeff Winn and the team at DotRas. ‘This option turns on “AutoLogon” in the VPN connection and the user wont be prompted for a username and password. 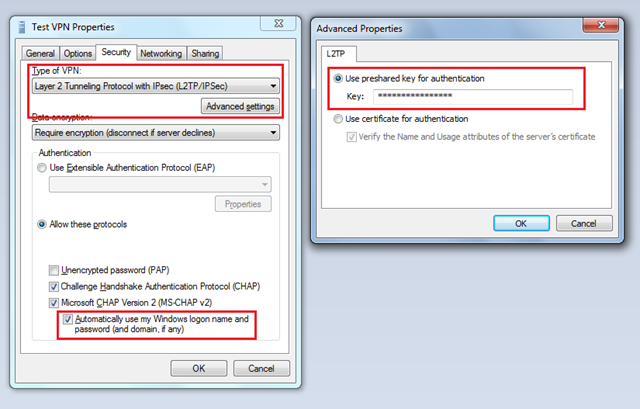 ‘ This option should always be false if the VPN connection does not use your Windows Login Credentials for authentication. ‘When “False”, this option overrides the Windows Login Credentials and passes the stored RAS credentials to the connection. ‘and a change to a VPN account password causes a new package to be built and delivered to the user. ‘ Test also if the connection is open, and if so, close it prior to re-installing the connection.